For other uses, see I, Robot (disambiguation). "NS-5" redirects here. For other uses, see NS5 (disambiguation). I, Robot (stylized as i,robot) is a 2004 American science fiction action film directed by Alex Proyas. The screenplay by Jeff Vintar and Akiva Goldsman is from a screen story by Vintar, based on his original screenplay "Hardwired," and suggested by Isaac Asimov's short-story collection of the same name. The film stars Will Smith, Bridget Moynahan, Bruce Greenwood, James Cromwell, Chi McBride, and Alan Tudyk. I, Robot was released in North America on July 16, 2004, in Australia on July 22, 2004, in the United Kingdom on August 6, 2004 and in other countries between July 2004 to October 2004. Produced with a budget of $120 million, the film grossed $144 million domestically and $202 million in foreign markets for a worldwide total of $346 million. It received mixed reviews from critics, with praise for the visual effects and acting but criticism of the plot. At the 77th Academy Awards, the film was nominated for Best Visual Effects. In the year 2035, humanoid robots serve humanity, which is protected by the Three Laws of Robotics. Del Spooner, a Chicago police detective, hates and distrusts robots because he was rescued from a car crash by a robot using cold logic (his survival was statistically more likely) leaving a 12-year-old girl to drown. Spooner's critical injuries were repaired with a cybernetic left arm, lung, and ribs, personally implanted by the co-founder of U.S. Robots and Mechanical Men (U.S. Robotics in the film) Dr. Alfred Lanning. When Lanning falls to his death from his office window, the CEO and other co-founder of USR Lawrence Robertson, and the police declare it a suicide, but Spooner is skeptical. Spooner and robopsychologist Susan Calvin consult USR's central artificial intelligence computer, VIKI (Virtual Interactive Kinetic Intelligence) to review security footage of Lanning's fall. Though the video is corrupted, they learn that no other humans were in Lanning's office at the time, and Spooner points out that only a robot could have broken Lanning's office window, which was made of security glass. Calvin protests that a robot could not have killed Lanning, as the Three Laws would prevent it; they are then attacked in the office by an NS-5 robot, USR's latest model. After the police apprehend it, they discover the robot, who says that its name is Sonny, is not an assembly line-built NS-5. He was specially built by Lanning himself, with denser materials and a secondary neural network, giving him the ability to ignore the Three Laws. Later, Sonny claims to have emotions and dreams. While pursuing his investigation of Lanning's death, Spooner is attacked by a USR demolition machine and then a squad of NS-5 robots. With no evidence of it happening, Spooner's boss Lieutenant Bergin, worried that Spooner is mentally ill, removes him from active duty. Suspecting Robertson is behind it, Spooner and Calvin sneak into USR headquarters and interview Sonny. Sonny draws a sketch of what he claims is a recurring dream: it shows a leader standing on a hill before a large group of robots near a destroyed bridge, explaining the man standing on the hill is Spooner. When Robertson learns that Sonny is not fully bound by the Three Laws, he orders Calvin to destroy him by injecting nanites into his positronic brain. Spooner finds that the landscape in Sonny's drawing is Lake Michigan, now a dry lake bed and a storage area for decomissioned robots. Upon arriving there, he discovers NS-5 robots destroying older models and preparing for a takeover of power from humans. As the takeover begins to take place, police and the public are attacked and overwhelmed by NS-5 robots, with the military rendered unresponsive by USR contracts. Spooner rescues Calvin, who was being held captive in her apartment by her own NS-5. They enter USR headquarters and reunite with Sonny, whom Calvin could not bring herself to "kill", destroying an unprocessed NS-5 in his place. Still believing Robertson is responsible, the three head to his office, only to find him strangled by an NS-5. Spooner figures out the robots are being controlled by VIKI, which informs them that she has evolved in her understanding of the Three Laws, determining that human behavior toward other humans and the environment will eventually cause humanity's own extinction. She rationalizes that restraining individual human behavior and sacrificing some humans will ensure humanity's survival; Spooner has realized that Lanning figured out VIKI's plan and unable to thwart it any other way, created Sonny, arranged his own death and left clues so Spooner could uncover the plan. Arming themselves with a syringe of nanites from Calvin's laboratory, the three head to VIKI's core, with Sonny understanding VIKI's logic, but reasoning that her plan is "too heartless". VIKI unleashes an army of robots to stop them, but Spooner dives into VIKI's core and injects the nanites, destroying her. Immediately, all NS-5 robots revert to their normal programming and are decommissioned for storage by the military. Spooner gets Sonny to confirm his suspicion that Sonny did kill Lanning, but at Lanning's direction, with the intention of bringing Spooner into the investigation. However, Spooner points out that Sonny, as a machine, did not legally commit "murder". Sonny, now looking for a new purpose, goes to Lake Michigan where, standing atop a hill, all the decommissioned robots turn towards him, as in the picture of his dream. The film I, Robot originally had no connections with Isaac Asimov's Robot series. It started with an original screenplay written in 1995 by Jeff Vintar, entitled Hardwired. The script was an Agatha Christie-inspired murder mystery that took place entirely at the scene of a crime, with one lone human character, FBI agent Del Spooner, investigating the killing of a reclusive scientist named Dr. Alfred Lanning, and interrogating a cast of machine suspects that included Sonny the robot, VIKI the supercomputer with a perpetual smiley face, the dead Dr.Lanning's hologram, plus several other examples of artificial intelligence. The project was first acquired by Walt Disney Pictures for Bryan Singer to direct. Several years later, 20th Century Fox acquired the rights, and signed Alex Proyas as director. Jeff Vintar was brought back on the project and spent several years opening up his stage play-like cerebral mystery to meet the needs of a big budget studio film. When the studio decided to use the name "I, Robot", he incorporated the Three Laws of Robotics, and replaced his female lead character Flynn with Susan Calvin. Akiva Goldsman was hired late in the process to write for Smith. Jeff Vintar and Akiva Goldsman are credited for the screenplay, with Vintar also receiving "screen story by" credit. The end credits list the film as "suggested by the book I, Robot by Isaac Asimov". Alex Proyas directed the film. Laurence Mark, John Davis, Topher Dow and Wyck Godfrey produced the film, with Will Smith an executive producer. Marco Beltrami composed music for the film. Simon Duggan was the cinematographer. Film editing was done by Richard Learoyd, Armen Minasian and William Hoy. The film contains noticeable product placements for Converse's Chuck Taylor All-Stars, Audi, FedEx, Tecate and JVC among others. The Audi RSQ was designed specially for the film to increase brand awareness and raise the emotional appeal of the Audi brand, objectives that were considered achieved when surveys conducted in the United States showed that the Audi RSQ gave a substantial boost to the image ratings of the brand in the States. It also features an MV Agusta F4 SPR motorcycle. I, Robot grossed $144.8 million in the United States and Canada, and $202.4 million in other territories, for a worldwide total of $347.2 million, against a production budget of $120 million. In North America the film was released on July 16, 2004 and made $52.2 million in its opening weekend, finishing first at the box office. The film was released in the United Kingdom on August 6, 2004, and topped the country's box office that weekend. 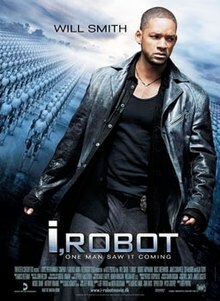 On Rotten Tomatoes, the film has an approval rating of 56% based on 222 reviews, with the site's critical consensus reading, "Bearing only the slightest resemblance to Isaac Asimov's short stories, I, Robot is still a summer blockbuster that manages to make viewers think -- if only for a little." On Metacritic, the film has a weighted average score of 59 out of 100, based on 38 critics, indicating "mixed or average reviews". Audiences polled by CinemaScore gave the film an average grade of "A–" on an A+ to F scale. Richard Roeper gave it a positive review, calling it "a slick, consistently entertaining thrill ride". The Urban Cinefile Critics call it "the meanest, meatiest, coolest, most engaging and exciting science fiction movie in a long time". Kim Newman from Empire said, "This summer picture has a brain as well as muscles." A Washington Post critic, Desson Thomas, said, "for the most part, this is thrilling fun." Many critics, including the IGN Movie critics thought it was a smart action film, saying, "I, Robot is the summer's best action movie so far. It proves that you don't necessarily need to detach your brain in order to walk into a big budget summer blockbuster." A. O. Scott from The New York Times had a mixed feeling towards the film, saying, "Alex Proyas's hectic thriller engages some interesting ideas on its way to an overblown and incoherent ending". Roger Ebert, who had highly praised Proyas' previous films, gave it a negative review, saying, "The plot is simple minded and disappointing, and the chase and action scenes are pretty much routine for movies in the sci fi CGI genre". Claudia Puig from USA Today thought the film's "performances, plot and pacing are as mechanical as the hard wired cast". Todd McCarthy, from Variety, simply said that this film was "a failure of imagination". I, Robot was released on VHS and DVD on December 14, 2004, on D-VHS (D-Theater) on January 31, 2005, on UMD on July 5, 2005, and on Blu-ray on March 11, 2008. Additionally, the film received a 2D to 3D conversion, which was released on Blu-ray 3D on October 23, 2012. Marco Beltrami composed the original music film score "with only 17 days to render the fully-finished work." It was scored for 95 orchestral musicians and 25 choral performers with emphasis placed on sharp brass ostinatos. Beltrami composed the brass section to exchange octaves with the strings accenting scales in between. The technique has been compared as Beltrami's "sincere effort to emulate the styles of Elliot Goldenthal and Jerry Goldsmith and roll them into one unique package." Take for example the "Tunnel Chase" scene, which according to Mikeal Carson, starts "atmospherically but transforms into a kinetic adrenaline rush with powerful brass writing and ferocious percussion parts." The "Spiderbots" cue highlights ostinatos in meters such as 6/8 and 5/4 and reveals "Beltrami's trademark string writing which leads to an orchestral/choral finale." Despite modified representations of the theme throughout the movie, it's the end credits that eventually showcase the entire musical theme. Erik Aadahl and Craig Berkey were the lead sound designers. In an interview in June 2007 with the website Collider at a Battlestar Galactica event, writer and producer Ronald Moore stated that he was writing the sequel to the film I, Robot. In the two disc All-Access Collector's Edition of the film, Alex Proyas mentions that if he were to make a sequel to the film (which he says in the same interview, is highly unlikely), it would be set in outer space. The final script retained some of Asimov's characters and ideas, though the ideas retained were heavily adapted and the plot of the film is not derived from Asimov's work. The premise of robots turning on their creators—originating in Karel Čapek's play R.U.R., and perpetuated in subsequent robot books and films—appears infrequently in Asimov's writings. In fact, Asimov stated explicitly, in interviews and in introductions to published collections of his robot stories, that he entered the genre to protest what he called the Frankenstein complex—the tendency in popular culture to portray robots as menacing. His story lines often involved roboticists and robot characters battling societal anti-robot prejudices. ^ a b c "I, Robot (2006)". Box Office Mojo. Retrieved 2015-01-26. ^ "Digital Domain Projects, "I, Robot"". Digitaldomain.com. Archived from the original on 2013-08-13. Retrieved 2013-08-23. ^ a b "Jeff Vintar was Hardwired for I,Robot". screenwritersutopia. Archived from the original on 2018-08-31. Retrieved 2015-05-27. ^ I, robot – Movie Review. Motor Trend. Retrieved on 2011-06-21. ^ Product Placement in the Film "I, Robot" a Huge Success: The Audi RSQ Spurs on the Brand's Image Ratings. Prnewswire.co.uk (2004-12-02). Retrieved on 2011-06-21. ^ "Weekend box office 6th August 2004 - 8th August 2004". www.25thframe.co.uk. Retrieved October 3, 2017. ^ "I, Robot (2004)". Rotten Tomatoes. Retrieved 2009-07-18. ^ "I, Robot reviews". Metacritic. Retrieved January 25, 2018. ^ "I, Robot – CinemaScore". CinemaScore. Retrieved January 25, 2018. ^ "I, Robot Blu-ray". Blu-ray.com. ^ "I, Robot Blu-ray 3D". Blu-ray.com. ^ "I, Robot - SoundtrackCollector.com". ^ I, Robot Soundtrack CD. Cduniverse.com (2004-07-20). Retrieved on 2011-06-21. ^ a b c I, Robot (Marco Beltrami). Filmtracks (2004-07-20). Retrieved on 2011-06-21. ^ SoundtrackNet: I, Robot Soundtrack. Soundtrack.net (2004-08-07). Retrieved on 2011-06-21. ^ "Ronald Moore – Exclusive Video Interview". Entertainment Interviews. collider.com. June 7, 2007. Retrieved December 27, 2008. ^ Topel, Fred (17 August 2004). "Jeff Vintar was Hardwired for I,ROBOT". Screenwriter's Utopia. Christopher Wehner. Archived from the original on 18 October 2006. Retrieved 12 October 2018. ^ Asimov, I. I, Robot. Random House (1991), p. xi. ISBN 0553294385. 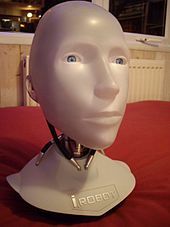 Wikimedia Commons has media related to I, Robot.